Dr. William S. Thayer, a Professor of Clinical Medicine at Johns Hopkins University School of Medicine, served as chairman of the medical and scientific department for the American Red Cross Mission to Russia, with the rank of Major. Commissioned in June 1917, the group traveled to Russia via Canada and Japan, along with the Red Cross Mission to Romania, arriving in Vladivostok on July 26, and Petrograd on August 7.The goal of the medical department was to deliver medical and surgical supplies to the Russian Army and to coordinate relief efforts with the Russian Red Cross and the All Union of Zemstvos and Towns. Thayer was present in Moscow in early November when the Bolsheviks overthrew the Russian provisional government headed by Alexander Kerensky. Given the chaos of the Russian Revolution, the Red Cross Mission to Russia soon ended. Thayer arrived back in the United States in January 1918. During his time in Russia, his wife Susan Chisolm Reed Thayer (Nursing class of 1892) died in Baltimore. Thayer was then ordered to be Director of General Medicine for the American Expeditionary Forces in France, with the rank of Major, Colonel, and eventually Brigadier General in the US Medical Corps, serving from February 1918 to January 1919. He oversaw the Medical Service of the US Army hospitals in France, while his Johns Hopkins colleague J.M.T. Finney was in charge of the Surgical Service. They established special medical emergency teams from the Base Hospitals to be sent to the front in periods of intense medical crisis to treat those suffering from surgical shock and gas poisoning. During this time, he was offered the directorship of the department of medicine at the Johns Hopkins Hospital and Johns Hopkins University School of Medicine, and his appointment was delayed until his return in 1919. He retired as professor emeritus in 1921. For his wartime service, Thayer received the Badge of Distinction of the Red Cross of Russia, the Distinguished Service Medal from the United States and the distinction as a Commander in the French Legion of Honor. 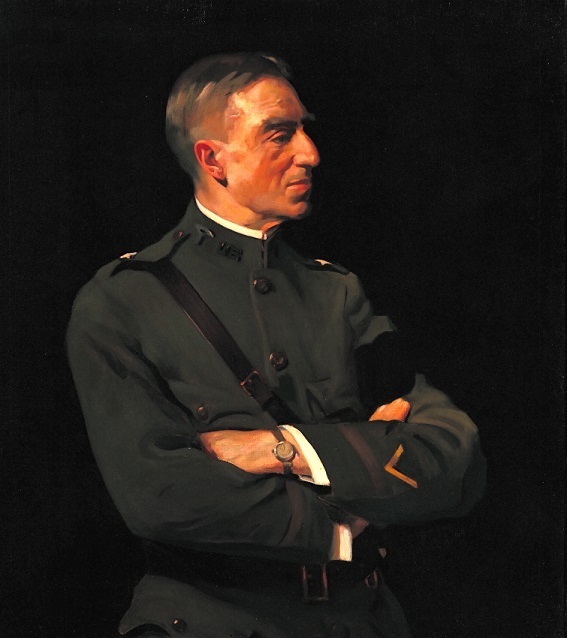 This oil portrait, which hangs in the Exhibition Gallery of the Welch Library Building, features Thayer in his military uniform and was painted in 1919 by Leopold Seyffert. The William Thayer Collection is available at the Alan Mason Chesney Medical Archives.